10. try to build the view. You will receive an error message that tells you that you need a cardinality setting of N:1 or 1:1 when using the “Optimize Join Columns” setting. This tells you that not all pre-requisits for the optimize join columns flag have been met. The cardinality setting of “n..m” prevents join pruning to occur. Therefore, the “Optimize Join Columns” flag is rendered irrelevant. To successfully build the model you can unflag “Optimize Join Columns” or set the cardinality to “n..1”. We want to demonstrate the working of the “Optimize Join Columns” option, therefore, change the join cardinality to “n..1” (compare screenshot below). As best practice check that this cardinality indeed holds in the data and there is never more than one matching entry for the join column “item” in the right table. In a real scenario you would like to guarantee this by some underlying loading logic. This pruning of the join column “item” changes the aggregation granularity for the maximum calculation that was defined in the aggregation node. To have a clearer understanding why the values changed, let’s start in “Debug this view” mode with the queries from above. Again you see that join pruning occurred. Importantly, this time column “item” is not requested in the debug query of the lower aggregation node. This shows that the selecting “Optimize Join Columns” excluded join column “item” at an early stage of processing. Based on the intermediate values of the lower aggregation node the maximum is calculated. 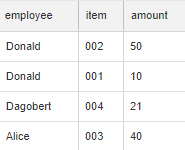 When “Optimize Join Columns” is not selected, the column “item” is kept in the aggregation granularity and the maximum calculation will happen for both records of Donald (item 001 and 002) leading to max(10)+max(50)=60 (compare previous screenshot of intermediate values). The summing stems from the fact that aggregation mode “SUM” is selected in the Semantics node. In contrast, when “Optimize Join Columns” is selected only one record is calculated for Donald: max(10,50)=50. Therefore, you receive different results for “Donald”, depending on whether the join column is omitted or not. If you had not used “MAX” as aggregation function but, for example, “SUM” in the aggregation node you would not see an impact of join column pruning. The reason is that “SUM” is not sensitive to the aggregation granularity at which it is calculated. Notice that you see fewer records when the Optimize Join Columns flag is set compared to when the flag is not set (3 vs. 4 records in this example). This has a small impact in this toy example but if you have many join fields that could be pruned away and in addition the join fields have high cardinalities pruning might have a substantial influence on the granularity of aggregation and thus the number of records that have to be processed subsequently. This means by reasonable usage of feature “Optimize Join Columns” performance benefits can be expected. Finally, to demonstrate that with join column pruning the resulting measure values might change depending on the columns requested let’s request one column (in this example “description”) from the right table so that join pruning and in consequence join column pruning cannot occur. Run the following query with “Optimize Join Columns” selected. As you can see with the additional column from the “right” table the results are the same whether or not the optimize join columns flag is set or not. 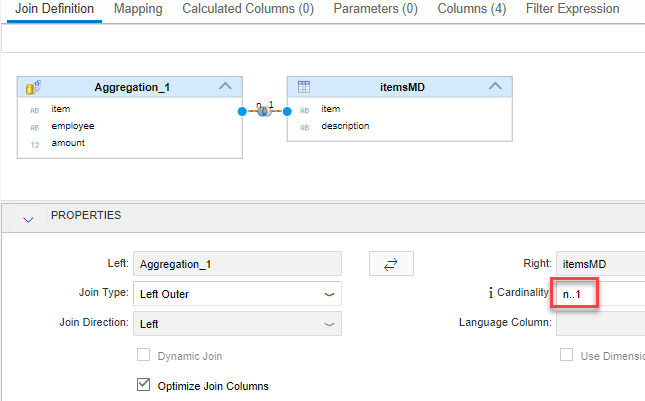 Put differently, without “Optimize Join Columns” selected the results remain the same whether or not “description” from the right table is requested while results change when “Optimize Join Columns” is set depending on whether “description” is selected or not. 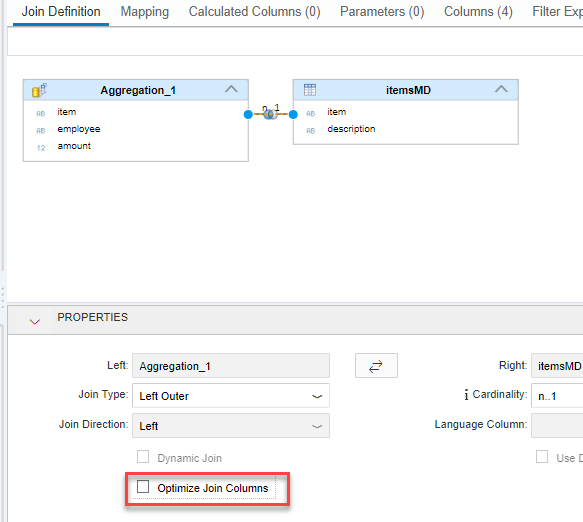 The EXPLAIN PLAN for the query on the Calculation View with the “Optimize Join Columns” flag set does not display the column “item” in the aggregation row. In contrast, without the “Optimize Join Columns” option selected the EXPLAIN PLAN on the Calculation View shows the field “item” in the grouping. By the way, join pruning can be observed in the EXPLAIN PLAN by the absence of the to be pruned table “itemsMD”. To see that compare the EXPLAIN PLANs above with an EXPLAIN PLAN of a query including “description” from the right table. In case “description” is included, two “COLUMN TABLE” entries will be shown. Click here to navigate back to the context in which this example is discussed.